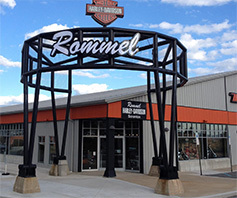 SCRANTON, Pa., January 19, 2018	(Newswire.com) - ​​The Rommel Harley-Davidson Dealership Group made a strategic decision to focus its efforts on its four store locations in Delaware and Maryland with the sale of Rommel Harley-Davidson of Scranton. Working with Brad Hopkins, President of Rommel Harley-Davidson Group, Powersports Listings Mergers & Acquisitions (PLMA) successfully consummated an intricate transaction, which involved the sale of a main point store and its satellite retail location (SRL) 20 miles away in Plains, Pennsylvania. This successful transaction came together as a result of PLMA's professional deal management process which provides complete buy / sell facilitation from the beginning conversations through the closing logistics. "Powersports Listings M&A has proven to be the most professional and thorough advisory team for our long-standing multi-unit Harley-Davidson Dealership ownership group. We value their management team approach beyond that of the usual sales broker. Powersports Listings M&A has the integrity to support and help protect our brand and interests throughout the sensitive buy / sell process. They have the knowledge and experience to eliminate wasted motions all the way through closing, so we can maintain focus on our ongoing business. Thank you for your help with another successful deal!" – Brad Hopkins, President, Rommel Harley-Davidson Group. New ownership under Thomas B. Hannum III, of Hannum's Harley-Davidson, assumed operations on Jan. 19, 2018. Powersports Listings M&A has proven to be the most professional and thorough advisory team for our long-standing multi-unit Harley-Davidson Dealership ownership group. Powersports Listings Mergers & Acquisitions (PLMA), the professional Powersports Industry dealership brokerage, specializes in professional intermediary services to buyers and sellers of Harley-Davidson and Powersports dealerships. The company is an independent affiliate of the Sunbelt Network, the largest and most professional business brokerage network in the world servicing privately held companies with offices across the U.S. and 11 countries worldwide. The PLMA difference is that its clients receive the benefit of a true advisory team with an unmatched domestic and international footprint that reaches far beyond that of an individual broker. Its Sunbelt affiliation provides proprietary technologies, world-class training, and the scale of the organization which sells more businesses than any other in the world. PLMA provides all of this to Harley-Davidson and Powersports dealership owners on a success fee basis. The PLMA team has over 50 years of combined Powersports Industry experience and has arguably handled the successful sale of more Powersports Dealerships than any other in the world. With relationships that run the spectrum from Industry Manufacturers, Distributors, Dealers, and Consumers, they employ an unmatched network to identify strategic buy/sell opportunities. The PLMA footprint and technology spans worldwide to ensure the most ideal buyer candidates are identified, whether currently in the Motorcycle / Powersports Industry or from some other line of business. The PLMA home office is centrally located in Dallas, Texas. To learn more about PLMA, please visit www.powersportslistings.com and our BLOG at powersportslistings.blogspot.com.